UNIVERSITY PLACE, Wash. — He won the first one the way players like to take majors, leading from the start at the Masters on a romp to the green jacket. The second for Jordan Spieth came Sunday night with a bit more difficulty. Had Dustin Johnson been a little more steady with the putter on the final green Sunday, they might still be playing for the U.S. Open trophy. Johnson wasn’t, much to the astonishment of the 6,000 or so who crowded the grandstands at maligned Chambers Bay for an Open finish like no other. He had to settle for holding his infant son off the 18th green on Father’s Day, instead of the U.S. Open trophy. That belonged to Spieth, the phenom from Texas who impressed so many by not only winning the Masters but the grace and composure he showed while doing it. He spoke after that win about bringing a present home to his special needs sister, and it was clear that meant almost as much to him as winning his first green jacket. He’s now halfway to history, yet still barely old enough to drink. The last player who did things like Spieth was named Tiger Woods, which seems so long ago. Now he’s the youngest since Bobby Jones nearly a century ago to win back-to-back major championships. Spieth has a chance to do what even Woods couldn’t and win all four of golf’s major tournaments in one year. Watching him Sunday on the crunchy greens at Chambers Bay, it was hard not to get the sense that he’s only just begun. The story line at this Open unfolded easily, like it was written by a golf historian of the future. Woods came here to try and salvage his game, while Spieth came to cement his mark as a generational champion in the making. Woods didn’t even make it to the weekend in yet another display of how humbling golf can be. The greatest player of his time seems forever stuck on 14 majors, and it remains to be seen how long he will keep embarrassing himself like he did here when he couldn’t even come close to beating a 15-year-old amateur before getting out of town on his private jet before the weekend began. It was Spieth who salvaged this Open, making it one to remember for all the right reasons instead of the wrong. His 3-wood to the 18th green on Sunday was the kind of shot that will live in Open lore, even if Spieth didn’t make the eagle putt and even if he had to rely on Johnson 3-putting from 12 feet to seal the deal. 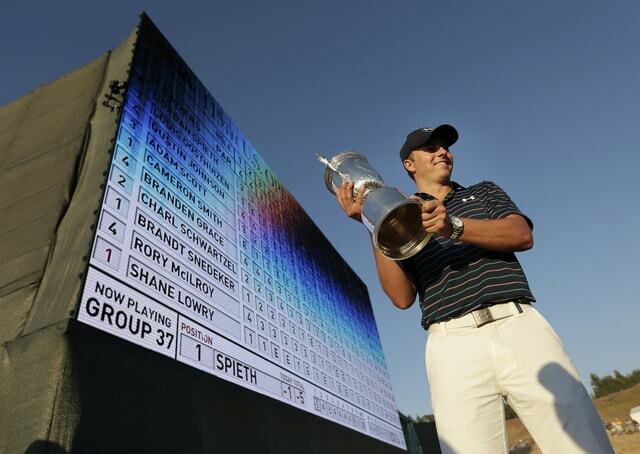 That Spieth did it without his best game should give his fellow competitors pause. His ball striking was just a bit off, he said, his putting not always up to his standards. It was the kind of thing Woods used to say, then go out and beat everyone anyway. It didn’t seem possible another player of that caliber would come along in his time, but here Spieth is at the age of 21 brimming with confidence as the British Open at St. Andrews approaches and the possibility of a Grand Slam looms. After doing all the right things to win his second title, Spieth said all the right things. He thanked his caddie, said he was happy just to be the brother of Steven Spieth, a shooting guard at Brown University. And he held the trophy and looked at his beaming father just off the 18th green to show off the best Father’s Day present ever. They won’t, after a Sunday that a lot of people in golf won’t soon forget either.